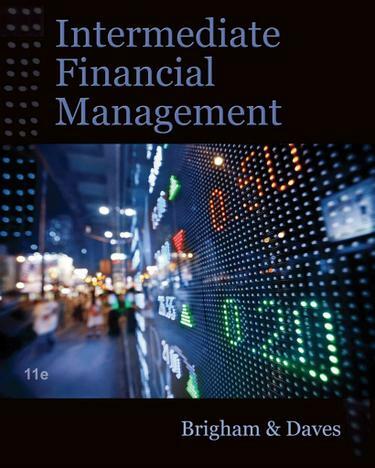 Brigham, Eugene F.; Daves, Phillip R.
Trust Brigham/Daves' INTERMEDIATE FINANCIAL MANAGEMENT 11E, the only textbook written specifically for Intermediate or Advanced Corporate Finance courses to provide your students with a full understanding of both conceptual theories and practical financial skills. This comprehensive text from renowned author team Gene Brigham and Phillip Daves reinforces coverage from earlier corporate finance courses for a clear presentation, while providing new, progressive material to challenge even the most advanced learners. The authors use corporate valuation as a unifying theme to emphasize the theoretic groundwork for value maximization and the practical skills to analyze business decisions. You will find in-depth coverage of core issues and the most current coverage of topics that are reshaping finance today. The book's reader-friendly approach incorporates actual business examples and integrated cases as well as Excel spreadsheet models to demonstrate how financial theory in practice leads to solid financial decisions. A comprehensive support package reduces your preparation time and offers your students practice using Thomson ONE-Business School Edition, the same financial online database Wall Street professionals trust every day. New Aplia for Finance, the leading online homework management system, and CengageNOW course management software are both optional solutions and help further ensure your students remain First in Finance throughout your intermediate or advanced corporate finance course.